When you design monograms letters or any other typography, you’ll come across the need to interlock the monogram letters. Interlocking monogram letters can be achieved with the Pathfinder Tools, but in this tutorial I would like to show you another way when you design monogram letters by using the Live Paint Bucket Tool. With the Live Paint Bucket Tool, we can interlock or overlap the monogram letters we’ve chosen in a much more intuitive and non destructive way. 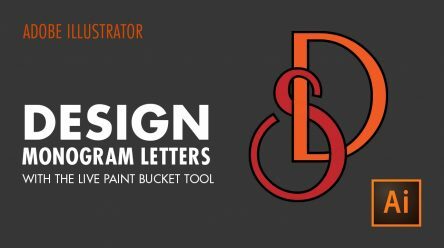 As the name suggests, the Live Paint Bucket Tool is a live tool and the video tutorial will show you how to design monogram letter when you want to interlock them. Shapes that are turned into a Live Paint Group stay fully editable. This means when you move or adjust your path’s shape, the colors that had been previously applied move with it. This method works well when you design monograms or logos and you’ll have the need for overlapping or interlocking elements. See how it’s done in the video tutorial below! If you select a color from the Swatches panel, the pointer changes to display three colors . The selected color is in the middle, and the two adjacent colors are on either side. Click a shape to fill it with the color you’ve selected.